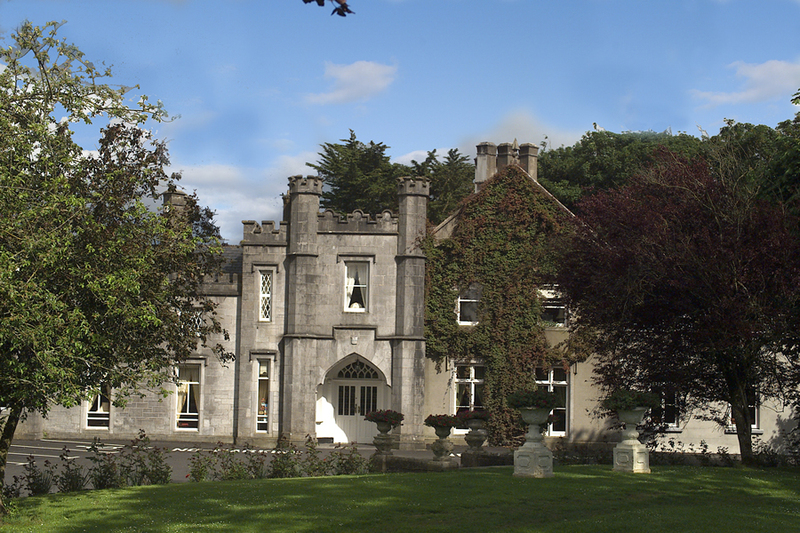 The 4 Star Abbey Hotel County Roscommon, is a charming 18th Century Manor House Castle Hotel in Ireland, set idyllically on it's own private grounds and gardens. In 1962 it was purchased by the Grealy family who established it as the exceptional hotel it is today. On arrival to our leisure club, seize the opportunity to sit back, relax and soak up the ambience of the magnificent 20m deck level swimming pool. The hotel is on the Galway road close to Roscommon town center. County Roscommon has an abundance of local attractions. The county is steeped in History and rich in folklore, it is also in the heart of Ireland where traditional Irish hospitality is at it's best. It is the land of castles and ancient kings, of stately homes, wild and wonderful landscapes, Burial mounds, mythological tombs, ring forts and many traces of early colonisation - all these things making Roscommon and the Abbey Hotel the ideal location for a holiday. I have to say, though we had been to many hotels, this definitely tops all. We got a quiet room with all mod com, the breakfast was superb. I am on a special diet and it was no problem to receive gluten free and milk free. The staff was corteous, the swimming pool clean. All in all we were very impressed. Myself, my husband and my 2 children had a wonderful stay at the Abbey Hotel. The staff were all extremely friendly and polite. We ate each night at the hotel and the food was delicious. We all enjoyed the leisure facility. The staff here were lovely too. I have recommended this hotel to my sister and she has booked 2 nights stay. Her daughter thinks she is staying in a princess castle.... She is so excited. Excellent Hotel. Leisure facilities very good. Staff very friendly. Would stay again. Very nice hotel, lovely, helpful staff and food was excellent. We ate in the bar on the first night and the restaurant the second night. Rooms were very warm and beds could have been more comfortable. However, kids had a great time and enjoyed their time in the lovely pool. Took a trip to Zipit at Lough Key and to the Arigna Mine on the way home. + Within walking distance of Roscommon town, gorgeous abbey and nice staff. We were away for my boyfriend's birthday and they left chocolates and a bottle of prosecco in our room. - There is no heating!! Our room was very cold. -Our shower was hot the first day but on the second day it was barely warm. -The restaurant food was not very nice and is extremely overpriced. Poor service from the waitresses also. In fairness to the staff they did take the soup off our bill when we complained! -The plugs in our room were quite inaccessible. -There is no mini-fridge which would be a welcome addition to keep water chilled. -The decor is also a bit outdated. Overall, it did not seem like a 4 star standard hotel. Very nice stay at the abbey. It is a nice and relaxed hotel and the staff are very good. There is lovely lawn to sit out on as well if the sun is shining and it backs on to the well preserved ruins of an old Abbey. The hotel is a short walk from Roscommon town and a short drive from Lough Ree. Great pint of Guinness as well! Stayed here for 2 nights. Reception area, lounge & bar all very nice. Rooms could do with modernisation although they were very clean. Spacious room and bathroom. Leisure centre very good and also very clean. Lovely staff, in particular the young barman (I can't remember his name but I believe he was Polish). Less than 10 minute stroll to the town. Nice pub across the road if you want a change of scenery - Bear an Raille/The Railway Bar. Food in restaurant and bar very good. I didn't eat in the carvery but it was very busy for a Monday & Tuesday so the food must be good. We really enjoyed our 2 night stay at the Abbey. Room was clean and staff very friendly. There was a quiet and calm atmosphere which suited us for a relaxing break. Food was also nice, but we felt the breakfast could have been hotter. Overall though, we had a lovely break and would definitely visit again. Very pleasant stay. Friendly and efficient staff. Old fashioned decor but charming. Stayed here with the kids for one night. Room was ok, could do with being redecorated. The food was really excellent, the pool was too. Would recommend this hotel and will definitely be back. Lovely stay. Great food and friendly staff. Pool clean and big. Lovely old fashioned hotel with superb staff and great food. Had a lovely break at the abbey hotel. the decor was beautiful and the atmosphere was relaxing the perfect place to relax and unwind my two kids loved it also. I love the Abbey Hotel. It's got old world charm. The staff are friendly. The atmosphere is relaxed. The food is good. The rooms are nice. The pool is lovely. We had a great stay... again. Very reasonable rate too for 2 adults and three children. Perfect for a relaxing, quiet break yet only a short walk from Roscommon town centre. Thoroughly enjoyed our weekend in The Abbey Hotel. Lovely friendly staff but as stated before probably not 4 star. Lovely old fashioned room but bed was small and too hot so not a great nights sleep. Pool area was lovely and everywhere was spotlessly clean. Would definitely return and to visit Artisan Bakery across the road. Our family of 4 had a good sized family room. The breakfast was very good with good choice. We used the pool and gym. We also had an excellent evening meal. We found the staff very friendly and helpful. Lovely hotel for a weekend break - great value for money - lovely staff - very nice and comfortable rooms - they certainly don't compromise on the heat - the hotel was extremely warm during a very cold January. Facilities are excellent - we didn't get to test the Leisure Centre - maybe next time. Old style hotel. Room clean and food good quality. Nice pool area. Staff very plesant. Will return again. V F Dublin. Lovely hotel, food is excellent, very central spot. Found the hotel at bit noisy at night but apart from that it was lovely. We stayed in the Abbey Hotel in Roscommon for a two-night break with our daughter. From the start the staff were exceptionally nice, helpful and friendly. The hotel is set in a lovely quiet area of the town, even though it is just a short walk from the town itself. While it says 4 Star, it really was more a shabby chic 4 star as it was a bit worn and dishevelled! However, the bar and lounge was just so comfortable, we spent most of our time just eating, drinking and talking in the lounge. The bar food was so good we didn't get a chance to try the restaurant. The staff were very accommodating and really very helpful without being intrusive. It really is a lovely hotel and we will definitely be back soon! The hotel was lovely just a bit disappointed that the double room did not have double bed. Also lots of noise through the pipes at night. Other wise very pleasant and breakfast was lovely. Excellent swimming pool which my son and myself used twice. The staff were friendly and the hotel is a good base to explore the surrounding areas. But we had two issues, when we went to get our fry at breakfast the sausages looked like they spent the weekend in the Arigna mines......they were black and burnt to a crisp (also no beans on display...you shouldn't have to ask). Also the beds were too hard unless you needed extreme support for your spine.....not a great nights sleep. This hotel should be a 3 Star not a 4 star. Stayed in the Abbey last week , not what I expected , rooms were very small very basic hotel , I will not be returning. I spent 1 night with my husband and my son and we had a great time. All the staff was very friendly, the swimming pool was great and we enjoyed the food too. Lovely hotel with a lot of character. friendly helpful comfortable. one thing that I feel sends the quality tumbling downwards is the tannoi announcements of evening events. disrupts the peace of a nice meal, conversation etc.awful! best hotel i have ever stayed in while being on holidays in ireland. Would recommend 100% !!!!!!!!!!!! Lovely Hotel. well recommended. Staff very friendly.would stay here again. Family of four had a wonderful stay in this beautiful hotel. The staff were exremely friendly and we will definitely return! Had a pleasant stay,staff were very friendly and leisure centre facilities were excellent. The hotel is lovely, the room was grand and the pool,sauna etc were excellent. There was no information in the hotel itself as regards things to do and see in Roscommon. Great Value for money, pool area and facilities were great, the rooms were nice and spacious, food was okay and the service was okay. The Abbey Hotel is one of the best hotels that We have recently stayed in. The hotel rooms are spacious and immaculate. The staff are very friendly and helpful. The food in the restaurant was excellent. The leisure centre was well equiped and clean. We will definately be returning for a longer stay in the near future.